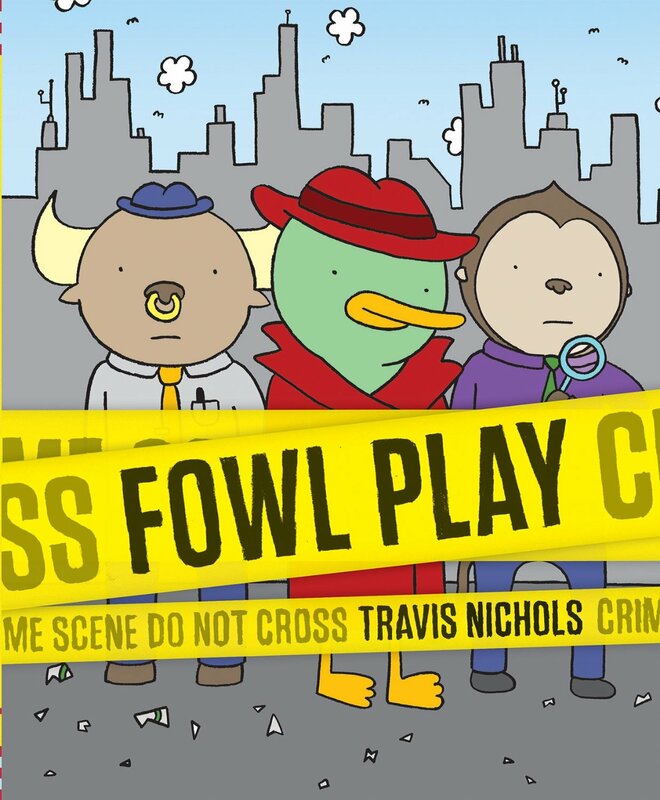 I LOVE Fowl Play by Travis Nichols!!! A graphic novel-style picture book, Fowl Play is filled with a fantastic cast of animals, a crime and a great detective agency that goes by the name, "Gumshoe Zoo." 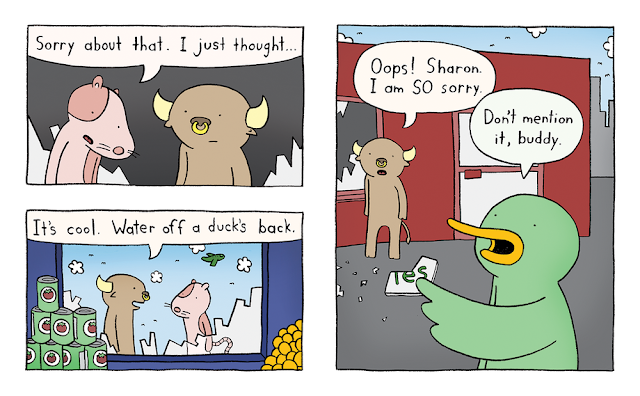 And Fowl Play is packed with non-stop idioms. Idioms! In a picture book! And it totally works! I can't wait for school to start so I can read Fowl Play over and over to my students. I also can't wait to see how they enjoy Fowl Play. Many of them are English language learners and probably won't "get" this aspect of the book, but I know they will love it regardless. Also, reading them Fowl Play is a great chance for me to try out some Spanish idioms on my kids. Someone has broken the window of Mr. Hound's store and he wants some answers. Quentin the goat takes the call, telling Mr. Hound, "You've got your goat, sir. We're on the case!" The team is called in and everyone has something to investigate and clues to share. Poking around, Quentin says, "There's something fishy going on around here." 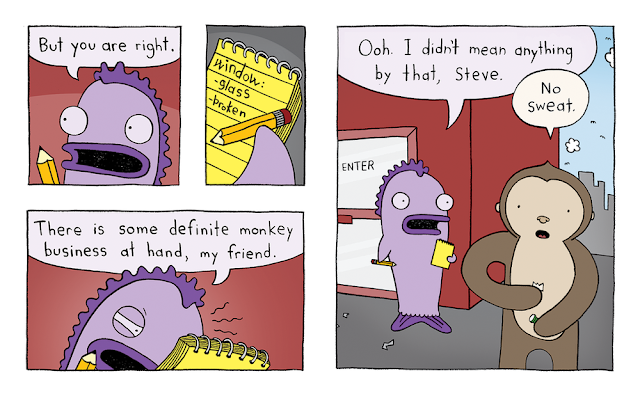 A page turn reveals Reggie, the fish, taking notes. Quentin apologizes profusely. Page turn after page turn, an idiom is launched and it lands with a laugh. Mr. Hound even manages to get two idioms into one exclamation! The mystery is solved, with each detective getting the chance to toss out one more idiom. As the reporter from W-IDM reports on the crime, another one is breaking urgently - a jumbo shrimp is terrorizing the town! The reporter signs off, wondering if "will our favorite sleuths be able to solve the mystery behind this beast of oxymoronic proportions? STAY TUNED!" I hope this means that the detectives from Fowl Play will be back for more! As the reviewer for Kirkus said so well, "Amusing to the point of provoking an inquiry. Really, it's the bee's knees." In the meantime, there are two pages at the end of Fowl Play that provide a great definition for what an idiom is and gives even more! In fact, the notes say that there are around 25,000 idioms in the English language! Even if it's not a book of word play like Fowl Play, I can't wait to see what Travis Nichols does next!